Even if you do not breed, own or ride a Cleveland you can support this wonderful British breed by becoming a member of this Society for just £35.00 per year (£45 for overseas members). The Society also offers Joint Membership for two persons living at the same address for £55.00 per year (£70.00 for overseas members). Under 18 year olds can join as a Junior member for £10.00 per year. Your involvement in social activities will be most welcome. As a member you will be able to actively help to promote and protect pure and part-bred Clevelands. If you would like to support the Society but do not want to join as a full member you can become a Friend of the Society for a minimum donation of £15.00, see the Become A Friend of the Cleveland Bay Horse Society article. Alternatively you can make a donation to the society from as little as £2. If you already own a pure-bred Cleveland Bay please make sure it is registered with this Society. A Cleveland is a valuable horse and it is important the Society is aware of it's existence. The Society also maintains a register for part-bred horses. To be eligible a horse must have at least one great grandparent entered in the stud book. If you have an unregistered pure or part-bred the Society will be pleased to help you in the registering of your horse. 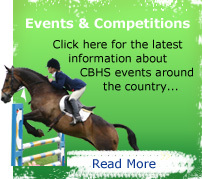 This will enable you to enter classes at shows throughout the country and to compete with your horse in the Society's show and performance horse competition. Registration with other bodies should not replace registration with this Society. If registration with the British Horse Database is necessary for you to compete in certain disciplines this can be arranged through this Society by the over stamping of Society registration documents. If you are joining for the first time, please just enter your name. If you are renewing your membership, please enter your name and membership number.